We were waiting for the moment when Apple will announce the new A9 chipset at the keynote that is currently going on, and when it will say how many times faster it will be than the chipset in the first iPhone, and the team didn't disappoint. Apple just made the A9X official, though, the one that is in the new iPad Pro, made with Samsung's 14nm process, and started throwing statistics at us. That didn't make the numbers less impressive, though - on the contrary - saying that the A9X GPU is 360x faster than the one in the OG iPad. Well, that one was released back in the day, so no wonder, but Apple has more to hurl at our cynical hearts. 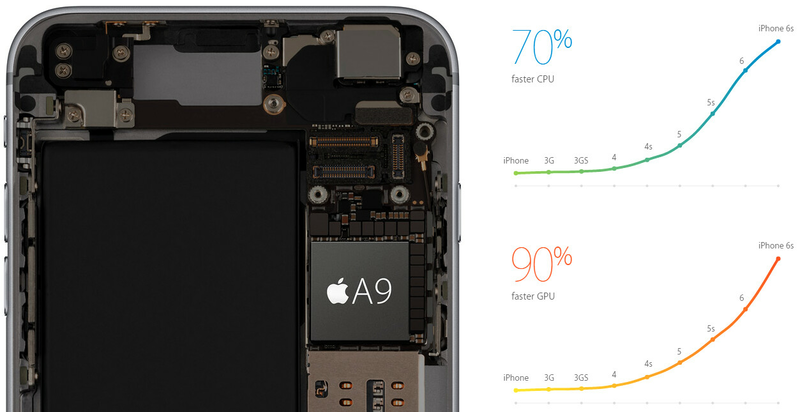 The A9X CPU is 1.8x faster than Apple's fastest chipset so far - the A8X you can find in the iPad Air 2 - and the GPU is two times zippier. More importantly, it also has two times the memory bandwidth, and a two times faster storage support. The GPU is so powerful, that it allows you to edit three 4K streams at once. Apple also unveiled the A9 chips that will be in the new iPhone 6s and iPhone 6s Plus, which is 70% faster than A8 at CPU tasks and 90% at graphics rendering tasks, and is again built at the 14nm FinFET production process. There is also a new M9 co-processor, which will allow for Siri to be called with the "Hey, Siri" command if the phone is locked. Overall, on a clock-for-clock basis, you can expect Geekbench scores on par with desktop-class processors with Intel's new Skylake architecture, and "faster than 80% of the portable PCs that shipped in the last 12 months" performance. Given how fast the A8 is, we are inclined to believe Apple, and are only waiting for the first benchmarks of Apple's 3rd gen 64-bit processor to hit the databases. An i5/i7 processor can beat that A9X for sure. My pentium 4 can beat it. This is the fastest CPU in tablet period it might outpreform some slower i5/i7 in laptops/mini pcs to. If what they said is true it will beat the core m family. the A8X alredy beats the m3, so this one should beat the m5 and probably the m7 both in CPU and GPU power. There are some in geekbench if you know what you are looking for. m3http://browser.primatelabs.com/geekbench3/search?utf8=%E2%9C%93&q=ASUSTeK+Athena m7 (just a test from Intel)http://browser.primatelabs.com/geekbench3/2637682 I would love to know a bit more about the A9/A9X, because this is the first time I find difficult to believe Apple claims in performance upgrade. Nope. My tablet has an i7 that is faster than this and it has more ram(8GB). But i5-i7 are $200+ chips. Ok I love my macbook but you exaggerate . Skylake i5/i7 kills every Arm processor for the moment. Years ago Arm was faster than intel 8086 or motorola 68000 and had 4mips in Acorn Archimendes. Who knows after some years that maybe happen again but for now the comparison is just ridiculous. I hope Apple to follow the steps of the new vaio (the new owners with out sony) and make an ipad like the VAIO Z CANVAS (that had a quad core processor inside and full windows 10 and intel iris pro !!!! Thats a pro tablet that you can use maya or 3d max or autocad or heavy photoshop or what ever you want. Iris pro 5200 persformans is near nvidia 840 m).... VAIO Z CANVAS that a pro tablet a real power house!!! this is how apple get to sell their stuff. by fooling people with things like this title. What did they do to fool people? I haven't met a single android fan who has used an ipad and didnt like it more than an android tablet. I'm a Windows fan and I don't like Android nor iOS, but if I had to choose I'd pick Android any day. And no, ipads don't always work flawlessly, I've had the misfortune to have to try and fix plenty of them, which isn't easy with such a closed system. I'll put it up against my Surface Pro 3 Core i7 anyday and beat it. The i7 in Surface pro 3 was only 20% faster than A8X and for shor time becouse it overheat inslanly, A9X will beat the s**t of it from the begining. From what I can find the SP3 i5 performed 50% faster than the ipad air 2 with an A8x in multicore geekbench. Heck, the Surface 3, which runs an Atom CPU, doesn't seem far behind ipad air 2.